An incoming student in the inaugural Occupational Therapy class, Cheyla was struck and killed by a vehicle on Aug. 8, 2016, just days before classes began. The mural design was voted on by Cheyla’s classmates and depicts a nature scene. It includes a ladybug, a nod to a family nickname for Cheyla, and the handprints of everyone who worked on the mural. A memorial plaque with a photo of Cheyla also will be added to the wall. Cheyla’s family drove up from Oklahoma and her fiancé from Texas to attend the unveiling. 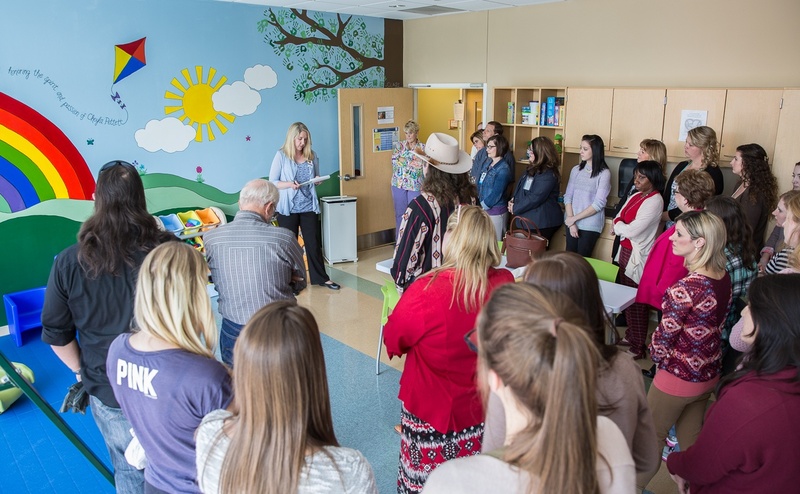 Her mother, Stephanie, wrote remarks that were read by Dr. Melissa Kimmerling, director of the Occupational Therapy program. Kimmerling presented a copy of the memorial plaque to Cheyla’s family and told them the classroom is a favorite on campus because of the mural, and everyone who enters will continue to hear about Cheyla’s loving and caring spirit for years to come. Several students shared their memories with the family, noting the friendliness and passion Cheyla showed during orientation.